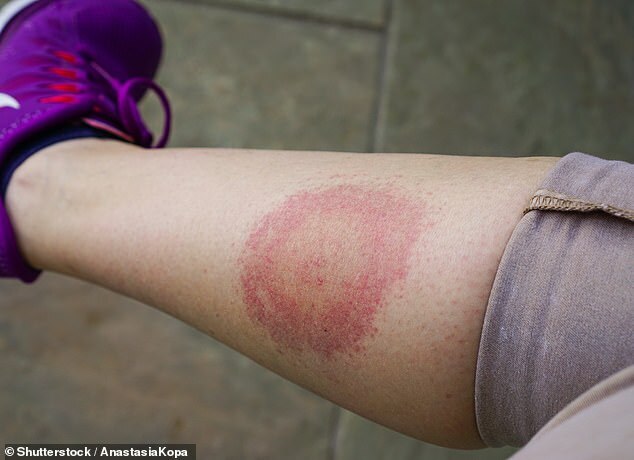 Doctors have been told to diagnose patients with Lyme disease immediately if they have the tell-tale ‘bull’s-eye’ rash. Rather than waiting for the results of blood tests, new guidance issued by the National Institute for Health and Care Excellence (NICE) urges medics to just look for the rash, which is present in around two-thirds of cases. Lab tests do not always pick up on the infection, which can slow the start of treatment. Lyme disease can usually be revolved with a three-week course of antibiotics. But if left untreated, the infection can lead to inflammatory arthritis, meningitis and even heart failure. ‘For most people with Lyme disease, a course of antibiotics will be effective, so it is important we diagnose and treat people as soon as possible,’ Professor Gillian Leng, director of health and social care at NICE, said. ‘A person with Lyme disease may present with a wide range of symptoms, so we have clear advice for professionals about the use of lab tests for diagnosis and the most appropriate antibiotic treatments. Lyme disease is a bacterial infection that spreads to humans via infected ticks found in woodlands throughout Europe and North America.